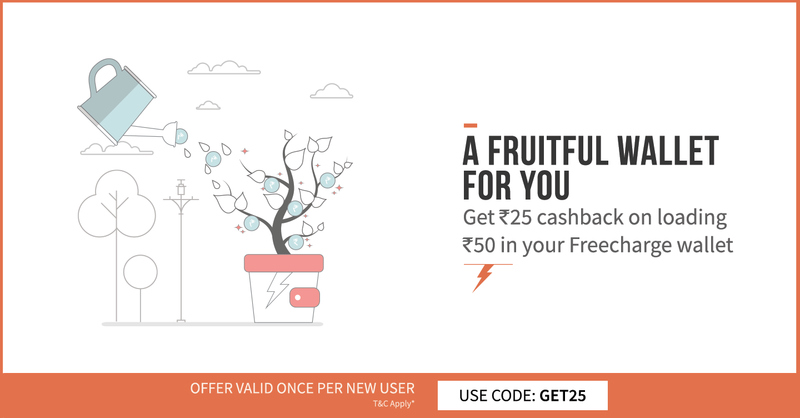 Freecharge is back with New offer for its New Users where you get 25 Rs Extra Caahback On Adding 50 Rs to your Freecharge Wallet. Avail this Awesome offer just by Following steps. How to get 25 Rs Cashback on Adding 50 Rs? 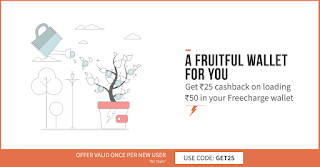 • Enter the promocode GET25 and click "Apply"
• Now proceed to add money to your Freecharge Balance and enjoy your cashback! - Valid on successful Addcash transaction of Rs.50 or more into Freecharge Wallet till 20th July 2016 . - Not Valid for amount added using FreeFund codes & Netbanking transctions. - Offer valid on Freecharge App, Web & mWeb.